Escape 2 - Expert Ski Goggle Advice. Free* UK Delivery! Above you will find some of the very best Ski Goggles available. Crammed full of vision-enhancing features and the latest technological advances these Ski Goggles maintain crystal-clear vision, no matter how demanding the conditions. Get your Ski Goggle choice right and you can be assured of greater comfort and improved visibility that in turn increases your confidence - being able to see all the lumps and bumps makes picking your line far easier. Make sure that you select the best Ski Goggles available for the light/conditions on the day and maximise your ski potential! The best Ski Goggles will fit your face/head and Ski Helmet securely and be comfortable to wear. The best Ski Goggle is one that uses the latest anti-fog double lens technology that draws warm, moisture-laden air out of the lens so that the Ski Goggle lens remains perfectly clear. The best Ski Goggle lens will depend on the conditions and light-levels expected in the day. For example on a bright sunny day opt for a Ski Goggle with a darker lens. A mirrored finish will also cut any glare for greater eye-comfort. For a 'pea-soup' day when visibility is severely curtailed, chose a Ski Goggle with a low-light lens that lets more light through. Yellow lens tints will aid depth perception, allowing you to make out the terrain more clearly. Because the best Ski Goggle depends on the day's light-levels, we love the Smith I/O 7 Ski Goggle that is supplied with two different, inter-changeable lenses, allowing you to have one Ski Goggle frame but select the right lens for the particular day. 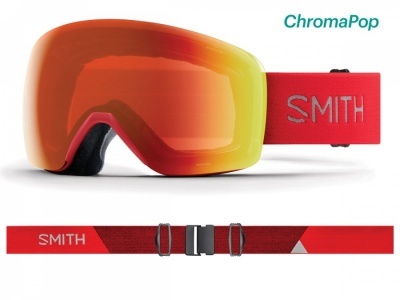 Smith Ski Goggles are the World-Leaders in Ski Goggle design. They use a myriad of tech features to ensure astounding visibility in demanding conditions. AirEvac Integration Technology pulls fog-causing moist air out of the Ski Goggle and into your Smith Ski Helmet where it can leave via the rear vents. 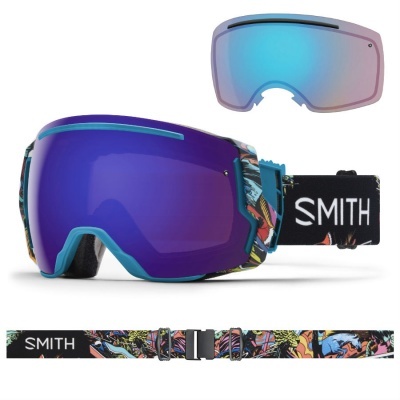 Smith produce a variety of Ski Goggle lens constructions to dramatically improve visibility, field of vision, accuracy and anti-scratch durability. 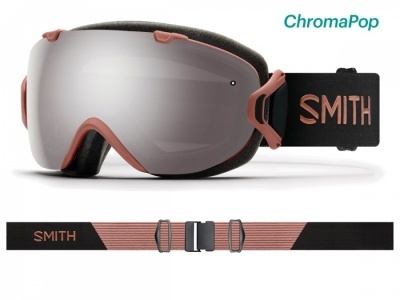 The frames of Smith Ski Goggles are robust, flexible, comfortable to wear and sized to fit with a Smith Ski Helmet. The foams used to back the frames are complex composites of different materials that allow softness next to skin and moisture-wicking ability to aid comfort and performance. Kid's Ski Goggles are essential for your child, you and your family to get the most out of your ski holiday! Frequently we speak to customers who thought that a cheaper pair of Kid's Ski Goggles would suffice, only for their child to experience the misery of not being able to see where they're going. Opt for a really decent pair of Kid's Ski Goggles and make sure that they can see accurately in low-light or bright light and that your child's eyes are protected from UV light. We also sell Kid's Ski Goggles that fit over the top of their prescription glasses. We sell a range of Ski Goggles that are designed to fit over the top of your prescription glasses. The anti-fog properties of a Ski Goggle Over The Glasses is very important to your visibility, as are superbly accurate lenses that don't distort vision. 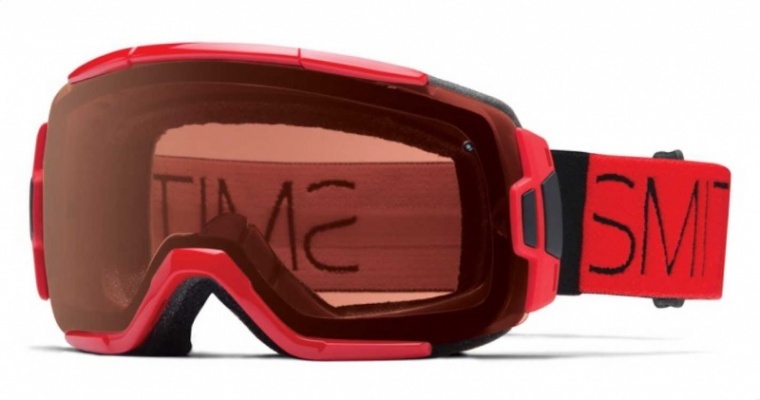 An OTG Ski Goggle has a frame size and depth to comfortably accommodate your glasses in addition to the standard visibility enhancing features of a Smith Ski Goggle.